Just unpack your bags and move into this turn-key furnished apartment in Brighton. Upon entering, the foyer opens to a sizable living room with dedicated dining. A wall of windows lets in excellent light and the glass doors open to your private balcony. The kitchen features gas cooking and has been nicely renovated with wood cabinets. The bathroom features a full bathtub/shower with tile surround, stone counter-top and wood cabinets. The oversize bedroom features a king bed with ample room for the desk. A great walk-in closet has been built out by California Closets. The apartment is equipped with a TV in the master as well as the living room. This rental comes with ONCE A MONTH professional cleaning and one full-size garage parking spot for easy living. 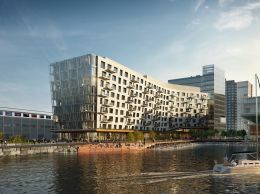 The building features a racquetball court, full-size pool, fitness center and is a minute's walk to public transportation (B-line) providing easy access to Boston and all Allston + Brighton have to offer. Not to be missed!